If you’re thinking about Laser Tattoo Removal Pittsburgh, but are hesitating because of the amount of time you’d have to invest, you should know that Beaver Valley Foot Clinic is using the most advanced laser technology available today. You want to remove a tattoo that contains the name of an ex-spouse. You no longer like your tattoo(s). You would like to get new tattoos and “fade” your older ones. You’d like to get a job that requires some or all tattoos to be removed. You can remove your tattoos easily and effectively using our new system, called the R20 Technique! 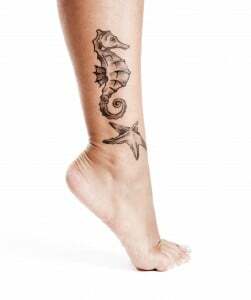 Beaver valley Foot Clinic removing a sea horse tattoo from female leg. 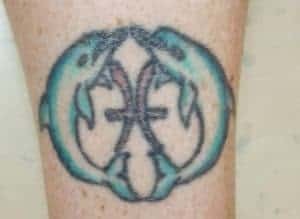 In the past, removing a tattoo has been a long, somewhat painful process. Now, there’s a procedure that will give you results in one session. The R20 Technique can remove the ink from a tattoo in just one-fourth the time of previous removal processes. So if you have required four treatments to complete a removal, the new R20 Technique takes only one. (Previously, eight sessions would now take only two session using this technology, and so on). Instead of having to wait for four months for a tattoo to be removed, you can now have it removed in n one day. If you’ve been told that your tattoo will take a year or two of treatments to fade and disappear, not it will only take a few months! We offer the most advanced technologies for laser tattoo removal. Both the R20 and PicoSure machine are very effective for removal. The R20 technique uses a laser to trace the entire tattoo. The laser causes gas bubbles form on top of the skin that contain bits of tattoo pigment. Once the bubbles start to disappear, the laser can be used again, this time penetrating more deeply into the skins. In one session, four passes of the treatment can be done, reaching further and further into the skin. The PicoSure removes tattoos quicker and more thoroughly than other machines. It can even remove tough colors such as reds, purples, greens and yellows. The Pico Sure uses PressureWave technology, which shatters the ink quickly. The PicoSure removes the tattoo within 4-8 treatments, without destroying the surrounding skin. About 75% of our patients have seen significant results within just 3 treatments! 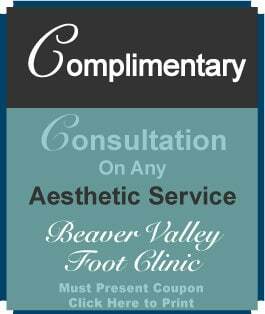 If you are looking for safe, fast tattoo removal, call Beaver Valley Foot Clinic’s partner, Body Beautiful Laser Medi-Spa, 724-987-3221 to make an appointment. We have 10 locations in and around the Pittsburgh area. 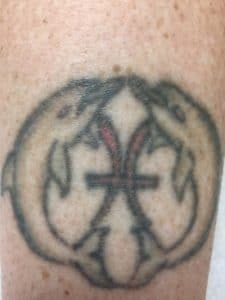 One of our certified laser technicians will be happy to speak with you and answer any questions about tattoo removal or any of our other aesthetic services. At Body Beautiful, we recognize that no one laser is right for every tattoo, and we currently have a laser for nearly all skin type / pigment color combination. However the majority of our treatments are done using the PicoSure laser by CynoSure Inc., which is widely regarded as one of the fastest, most powerful lasers in the industry today. The laser delivers a highly focused beam of light which almost immediately imparts huge amounts of energy into the pigment particles which make up the tattoo. This causes them to shatter into pieces small enough for your body’s immune system to eliminate naturally. This is why some lightening is seen immediately following treatment but majority of the improvement occurs in the following weeks. Each individual session is short, generally lasting only about 5-7 minutes. The actual number of sessions will always vary from tattoo to tattoo. Many variables effect this number, including tattoo color, location, ink density, skin tone, and the strength of a patient’s immune system. Taking these things into account, our staff can estimate the number of treatments you’ll need quite accurately. There’s no one size fits all approach. One common misconception out there is that it only takes one session to remove a tattoo. Many people come into the office with this idea in mind. Even when using the ultramodern Astanza Trinity laser, most tattoo removals will take an average six to twelve sessions to fully remove a tattoo. This, of course depends on the size, shape, and location of the tattoo. The Astanza Trinity laser is state of the art technology and the pinnacle on advancements in tattoo removal. The entire process will take around a year to completely remove a tattoo. Several sessions are needed to break down the ink. Between each removal session, there is a mandatory healing period of 4 to 6 weeks. During this recovery time, your body is working hard to dismantle the ink into smaller parts and flush it from your body. You must give your body 4 to 6 weeks to process the ink and recover its ability to remove more ink. If you don’t give your body time to do its work and properly heal you will put the body under too much stress and it will not be able to effectively remove the ink during the next session. Is there anything else I can be doing to support the Laser tattoo removal process? Obviously the laser plays a major role in removing your tattoo but some simple lifestyle changes can play a powerful role as well. By changing your behaviors, you can reduce the length of time it takes for your body to remove your tattoo. Individuals with healthy lifestyles discover that their immune system more quickly removes their tattoos than those who live relatively unhealthy lifestyles. You can support your body leading to better results more quickly by drinking lots of water and exercising more. You should stop smoking and avoid consuming large amounts of alcohol. Your immune system is tasked with breaking down the ink in your tattoo. The healthier your immune system is, the easier it will be for your body to break the ink particles down and flush them out of your body. What is the recovery period like after a session? The process of removing a tattoo can be different for everyone. You can typically expect an average of 6 to 12 treatment sessions spaced out every 4 to 6 weeks. Most people find that laser tattoo removal is an simple process concluding in great results. After each session, you will want to apply ice to and elevate the area as much as possible for the first 24 hours, especially at night. It is important to keep the area clean and infection free. You should use antibacterial soap and warm water to clean the treated area at least three times a day for the first two weeks after a laser removal session. Apply a ultrathin layer of Aquaphor (or another similar product). It is important not to apply too much as the skin needs to breathe. Cover the area with non-stick sterile pads and avoid direct sunlight for at least two weeks. Yes, and this is precisely what an increasing amount of patients are choosing to do. They’re getting sections of a tattoo removed so that the design can be cleaned up or reworked. Others choose to have just enough treatment to fade the tattoo enough for a cover-up design. Immediately after treatment, the skin takes on a “frosted” appearance. This whitish color is due to many small steam bubbles forming within the outermost layers of the skin, and results in a pale, chalky color. This will fade within a few days. The formation of many small blisters is also extremely common. There’s usually some degree of redness and swelling over the treated area, but this generally subsides within hours without treatment. At most, an ice pack and an over the counter pain medication such as ibuprofen will be used. Within hours you’ll begin to notice a scab-like crust beginning to form. This is part of the natural healing process, and it’s vitally important to not pick at this in order to avoid scarring or the formation of unwanted pigmentation. Note that scarring is very rare with newer Q-switched lasers. It’s recommended that you generally take it easy for the first 24 hours after a laser tattoo removal treatment. Apply an ice pack as needed to control pain and swelling. Many patients use over the counter non-steroidal anti-inflammatory medicines such as ibuprofen and naproxen for this purpose as well. Avoid aspirin, however, which is a powerful blood thinner and can increase the risk of excess bleeding. It’s critical to not pick at the scab which forms or pop any blisters. There’s going to be some itching and minor discomfort, but resist the urge to pick. Equally important is proper sun protection for the first 2 weeks following treatment. Use a sunscreen with 50 SPF or above, or better yet stay out of the sun entirely. Also strictly avoid soaking the treated skin in any form, such as swimming or sitting in the hot tub. For best results, follow after-care instructions to the letter. This will ensure that as much ink as possible is removed each session, and that side effects such as pigmentation changes, texture changes, scarring, and infection won’t occur. 1: Apply an A & D antibiotic ointment such as Neosporin to the area 3 times a day during the acute healing phase. 2: Keep the treatment area covered with a loose, breathable dressing for the first 2-3 days post treatment. 3: Protect the area from direct sunlight. Use a high Sun Protection Factor (SPF) sunscreen, preferably 50 SPF. Better yet, keep the area covered with clothing. Excessive sun exposure is one of the biggest reasons some patients fail to achieve excellent results. 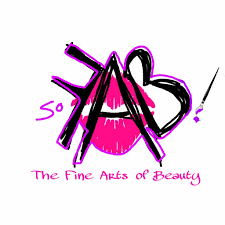 4: Don’t apply cosmetics over the treatment area during the initial, acute healing phase. 5: Avoid soaking the area in water for the first two weeks after treatment. Don’t’ take baths (shower instead), and stay out of the pool and hot tub. Patients who follow these simple rules achieve the best results. 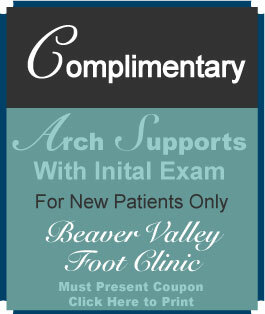 At Beaver Valley Foot Clinic, we view proper after care as an integral part of the laser hair removal process.